Introduction to the Séance Room*: Students will learn the specifics of a séance such as rules and etiquette, what to expect, how natural law applies, healing and spirit manifestations. Students will experience an actual séance. *Prerequisite: Guides and Guidance. Introduction to Trance Mediumship*: Learn how the physical body is used by an outside intelligence or a spirit form (doctor, guide or loved one) presenting ideas, truth, knowledge and blessings. The student will learn trance theory and practice. *Prerequisite: Guides and Guidance. Laws of Mediumship: This class is a study of the laws governing mental and physical mediumship. Subjects covered will be clairvoyance, trance, direct voice, apports, spirit card writing, and healing. Mediumship Ethics: This class will explore some of the ethical issues the medium may encounter in giving messages and readings in the practice of mediumship. Natural Law II*: This class is a continued study of natural laws of the uni-verse and how to use them to balance our lives. *Prerequisite: Natural Law I. Public Presentation of Mediumship: The student will learn the acceptable methods of public and private clairvoyance and platform decorum. 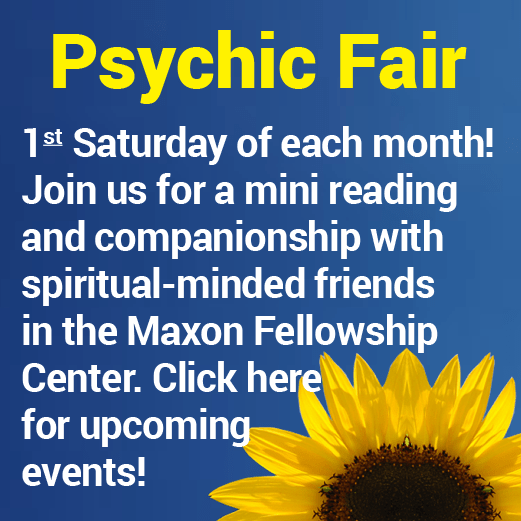 Practical Aspects of Mediumship: This is a very thorough class on the considerations, planning, preparation and challenges of doing private readings, clairvoyant circles, psychic fairs, etc. Attention to detail in preparing the environment, responsibility to clients will be explored. Symbols I: A basic foundation in symbology will be presented, including the interpretation of universal, conventional and personal symbols and their guidance in our lives. Symbols II*: This class is a continued in-depth study of the use of symbols. *Prerequisite: Symbols I.
Worship Service Practicum: This class incorporates the practical aspects and duties involved in the Spiritualist worship service, including proper platform decorum of the chairperson position, lecture/sermon presentation, mes-sage work, and proper etiquette in ushering. Minimum of two (2) years on-going study at Chesterfield Spiritualist College. 25 Credits (10 Spiritual Seeker classes, 15 Mediumship classes). Must have successfully completed the Spiritual Seeker test with a score of 80% or more. Successfully complete an oral demonstration of mediumship abilities. Development Classes: Twelve (12) classes with a certified staff mediumship or trance development class teacher over a period of three (3) week-long seminaries: a). Eight (8) classes will be Mediumship development. b). Four (4) classes may be mediumship or trance development based on the students choice. c). Four (4) classes per week-long seminary with one (1) staff teacher per seminary. Development Class Alternative: Regularly attend development classes with a certified mediumship development class teacher. A minimum of 12 classes and signature of teacher required. Student Services: Three (3) clairvoyant demonstrations during three different seminary week or Sunday student services. Certification for Medium Missionary will be conferred following recommendation by the Dean of Education and approval by the Board of Trustees. All academic and practical requirements must be completed before Intent to Test is submitted. Intent to Test and all required documentation must be submitted to the Dean of Education one month prior to the seminary in which the student plans to test. Application to test along with the testing fee must be completed at walk-in registration for the seminary in which the student plans to test. Pass a comprehensive written exam covering current Medium Missionary classes with a score of 85% or more. Successfully complete an oral demonstration of evidential mediumship with the testing committee. Certification for Medium Missionary will be conferred following recommendation by the Dean of Education and approval by the Board of Trustees during the consecration ceremony.